Infrared inspections of building exteriors often rely on solar loading to create temperature differentials necessary to detect damage or defects. A common challenge for thermographers is inspecting building elevations that do not receive direct sunlight. Infrared imaging is a proven technique for testing building sidewalls. Inspecting buildings during evening hours following a sunny day can reveal the presence of structural details, missing or damaged insulation, or latent moisture. These conditions are detectable due to changes in the thermal capacitance or conductance of the walls. When using solar energy to drive an infrared inspection of building sidewalls, it is normal for a building to heat unevenly. Typically, east elevations receive the least direct sunlight, while the south and west elevations receive the most. For many northern latitudes, north elevations do not receive direct sunlight. Fortunately, it is not necessary to receive direct sunlight in order to drive an infrared inspection. Provided that the building is not in close proximity to other structures or heavily shaded areas, it will receive indirect heating from nearby objects such as the ground. For elevations that are heated indirectly, it is important to note that they will exhibit weaker thermal patterns when compared to other exposures that receive direct sunlight. Lastly, be aware that thermal patterns associated with defects may only appear for a short period of time on the North and East elevations. All thermal anomalies should be investigated for cause and appropriate action taken. Infrared inspection of building envelopes is one of the many topics covered in the Level I Infraspection Institute Certified Infrared Thermographer® training course. For information on thermographer training including course locations and dates, visit us online at www.infraspection.com or call us at 609-239-4788. With prices ranging to over $30,000, a thermal imager can represent a considerable investment. For companies getting started in thermal imaging, renting an imager can provide a cost effective alternative to purchasing a system outright. Whether you are facing an equipment shortage or looking to evaluate the characteristics of a new imager prior to purchase, renting a thermal imager may provide a solution. In some cases, imager manufacturers will credit short term rental fees toward the purchase price of an imager. As with purchasing an imager, there are several important things to consider when arranging for a rental unit. When arranging for a rental, obtain terms and conditions from the rental agency. These should include, but not be limited to: rental period, extension of rental, shipping costs, and requirements for insurance against loss. One should also consider the rental agency’s ability to provide technical support during the rental period. For more information on choosing an infrared imager, refer to the article, “Selecting, Specifying, and Purchasing a Thermal Imager” available as a free download on this website. Lastly, the greatest limiting factor in any infrared inspection is the thermographer. For accurate results, infrared inspections should only be performed by properly trained and certified thermographers. For more information on thermographer training and certification, please contact Infraspection Institute. “Jack Frost nipping at your nose.” These lyrics from a popular Christmas carol evoke romantic visions of winter; however, frostbite and hypothermia are dangerous medical conditions that can present serious safety hazards. For many, the dead of winter is upon us. Thermographers working outdoors in cold climates can face serious safety challenges due to frostbite and hypothermia. Knowing the symptoms of these conditions and proper treatment is imperative for worker safety. If frostbite or hypothermia is suspected, begin warming the person slowly and seek immediate medical assistance. Warm the person’s trunk first. Use your own body heat to help. Arms and legs should be warmed last because stimulation of the limbs can drive cold blood toward the heart and lead to heart failure. If the person is wet, put them in dry clothing and wrap their entire body in a blanket. Never give a frostbite or hypothermia victim beverages containing caffeine or alcohol. Caffeine, a stimulant, can cause the heart to beat faster and hasten the effects the cold has on the body. Alcohol, a depressant, can slow the heart and also hasten the ill effects of cold body temperatures. Last week’s tip discussed the dangers of Frostbite and Hypothermia while working in cold temperatures. This week’s tip covers cold weather clothing. Cold weather clothing is a matter of functionality not fashion. Clothing needs to be worn in layers in order to trap air which is warmed by the body. When selecting clothing, start with the innermost layer and work outward. The use of multiple layers will trap warm air while providing greater ease of movement. As you add layers, be sure to adjust the next layer’s size accordingly. The first layer should be made of a synthetic material that will wick perspiration away from the body and maintain its insulating properties when damp. The second layer is your main insulator and should be a breathable material that maintains its insulating properties when wet. Synthetic fleeces or natural wool are good choices. The outermost layer should be breathable and both wind and water resistant. Head and neck protection is a must since nearly 40% of body heat is lost here. Perspiration is the main enemy of feet. The best footwear will have sturdy outers, good treads and a removable felt liner. Buy extra liners and replace them every few hours. Liners can take a full day to fully dry out so buy enough to get through a typical workday. Mittens are the warmest but present problems in grasping tools etc. I have found that a heavy duty welder’s glove with cotton or wool gloves lining them provide good warmth and mobility. Buy enough liners to get you through the day. One final note, the body needs fuel to produce heat. Your calorie needs increase in cold weather and require regular replenishment with good wholesome foods. When documenting an infrared inspection with no detectable exceptions, thermographers should be aware that there is a big difference between reporting “no problems” versus “negative findings”. Infrared inspections may be performed for a wide variety of reasons including condition assessment, quality assurance and predictive maintenance. In its simplest form, thermography detects, displays and records thermal images and temperatures across the surface of an object. In many cases, thermal anomalies are indicative of deficiencies, changes, or undesirable conditions within the object or system being inspected. Typically, such conditions are reported with a thermal image and a description of the anomaly. Upon completing infrared inspections during which no anomalies are detected, thermographers will frequently report that the subject system has “no problems”. From a liability standpoint, this can increase a thermographer’s risk since there may exist problems that are simply not detectable by thermography. Most importantly, a proclamation of “no problems” may leave an end user with a false sense of security regarding the condition or integrity of the subject system. Since it is not possible for thermography to detect all potential problems within a given system or object, it is advisable for a thermographer to report “negative findings” when no anomalies are detected. This statement is direct, to the point, and in accordance with terminology utilized in other types of scientific testing. Although the difference between “no problems” and “negative findings” may seem small, the proper use of terminology can help to prevent costly and embarrassing misunderstandings. 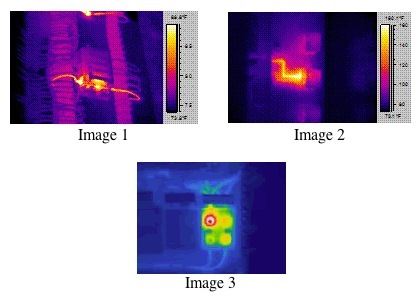 Infrared inspections of electrical systems can help to improve the efficiency of a preventive maintenance program. In this Tip, we focus on several key considerations for setting up inspection routes. Electrical infrared inspections are best performed when carefully designed routes are set up listing the equipment to be inspected. But how does one go about designating a route? To answer this, you must first understand your electrical system layout. Keep in mind that electrical systems are designed to fit the type of operation of a facility. In general, in-plant electrical systems begin with higher voltage classes nearest the incoming source of electricity and branch down to lower voltage classes via transformers to meet specific power demands throughout the facility. Infrared inspection routes can set up based upon various criteria including but not limited to, specific areas or operations in your facility, by voltage class of equipment, by individual circuit branches, by criticality to operation of a facility, or other determining factors deemed important. Keep in mind that routes should be limited to the amount of equipment that can inspected in a single day or shift. Routes should also start with high-voltage equipment closest to the incoming power source as failures high in the electrical hierarchy generally affect larger portions of the facility than lower voltage equipment. ~ Tip provided by Brady Infrared Inspections, Inc. When performing an infrared inspection of the interior of a building, you may be able to visually observe full-size thermal images without your thermal imager. The cause of this phenomenon is simple dust and dirt normally found within most buildings. Many buildings employ cavity wall details in the construction of interior spaces. When the exterior of framed walls are exposed to cold temperatures, areas with diminished R values will cause the interior surfaces of the wall to cool. Such cold areas may be caused by framing members or wall cavities with missing or damaged insulation. If interior humidity levels are high and outdoor temperatures sufficiently low, moisture will condense on the wall surfaces within the occupied spaces. Once moisture condenses on the wall surfaces, dust and smoke particles can collect in these areas and will remain once the wall surface has dried. Thermal patterns caused by dust and condensation are readily observed for light-colored walls with smooth surfaces such as drywall coated with smooth latex paint. The intensity of the resulting dust patterns will be dependent upon humidity levels, wall temperatures, and the amount of particulates within the air. Typically dust patterns are more intense within areas occupied by smokers, within kitchens, near woodstoves or fireplaces, or in areas where candles are burned. Over time, dust patterns can become quite pronounced and will often clearly show every framing member and insulation deficiency within the wall. Load break elbows are a common feature on shielded cables. Thermography may be used to provide evidence of loose or deteriorated connections associated with these connectors. Load break elbows are insulated plug-type terminals typically used to terminate shielded, underground cables. Load break elbows act as large power plugs for connecting cables to transformers, switching cabinets and bushings equipped with load break receptacle bushings. Internal to load break elbows are several mechanical connections each of which is subject to deterioration over time. A typical elbow contains a crimp connection and a pin electrode that screws into the elbow. During normal operation, this pin electrode mates with a receptacle which also contains mechanical connections. Elbows and receptacles that have loose or deteriorated connections will operate at elevated temperatures and are readily detectable with a thermal imager. Thermogram shows hot elbow due to loose internal connection. Normally, all electrical connections within an elbow are hidden from view due to the elbow’s molded rubber insulating body. Due to their high emittance, load break elbows are excellent candidates for infrared inspections. In fact, thermal imaging is one of the best ways to inspect these components for the integrity of their connections. Since line-of-sight access to the electrical connections within load break elbows is not possible, temperatures at the point of origin are likely to be much hotter than observed temperature values on the exterior surface. Small Delta T’s observed on the surface of elbows can be indicative of a serious problem. Because of this, hot load break elbows should be investigated for cause as soon as possible and appropriate corrective measures taken. Many infrared imagers utilize PC cards to store imagery and data. Due to advances in technology, storage capacity of flash cards has increased. Unfortunately, some older thermal imagers will not work with newer, large capacity flash cards. PC cards, also known as flash cards, first appeared as removable storage media on some thermal imagers beginning in 1995. At that time, the average capacity of PC cards was 5 MB of data. Over time, the storage capacity of PC cards has increased dramatically. As of 2008, several thermal imagers are using PC cards with a capacity of 1 GB or more. Newer infrared imagers, digital cameras, pocket pc’s and other devices are likely able to recognize, read and use smaller capacity PC cards. Older thermal imagers and electronics may not work with a larger and faster PC card such as those with 1GB or greater capacity. With the fast changing digital electronics market and the demand for larger memory cards, smaller capacity PC cards are becoming more difficult to find. Most electronic stores and large retail stores no longer carry PC cards smaller than 1 GB. Some camera stores still have a limited selection of the smaller capacity PC cards. In some instances, it is possible to use memory card adaptors such as, xD to CF; however, success is sometimes limited. For example, it may be possible to save data onto a memory card, but not read or view the data previously saved on the same device. If you have a thermal imager that is not compatible with modern PC cards, it may be wise to obtain compatible PC cards while they are still available. Many electronic devices including infrared imagers are powered by lithium batteries. Effective January 1, 2008, US Department of Transportation regulations prohibit loose lithium batteries in checked baggage onboard aircraft. 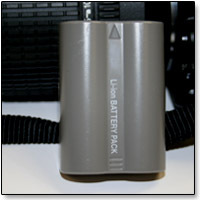 Spare batteries, also called “loose” batteries, are batteries which are not installed in equipment. A lithium ion battery inside your computer is an installed battery. A battery you carry separately in case that battery runs low is a spare battery. For loose batteries, place tape across the battery’s contacts to isolate terminals. Isolating terminals prevents short-circuiting. For personal use, there is generally no restriction on the number of spare batteries allowed in carry-on baggage. This is the case for cell phone batteries, “hearing aid” button cells, and AA batteries/AAA batteries available in retail stores, as well as almost all standard laptop computer batteries. For some devices, lithium batteries are permitted in checked luggage provided they are installed in the device. If you pack a device containing batteries, secure it against activation by locking the activation switch in the “off” position, placing the device in a protective case, or by other appropriate measures. For more information, visit the TSA website. Tip provided by: Brady Infrared Inspections, Inc.
Infrared inspections of electrical systems often include high visibility equipment such as substations, switchgear and motor controllers. In this Tip we discuss several critical items that are often overlooked during infrared inspections. Perhaps one of the most overlooked pieces of equipment during an infrared inspection of electrical substations and indoor electrical switchgear is the control cabinets located beneath breakers in outdoor substations and above or on the side of rack-in breaker bays on 480V and higher indoor switchgear. Equipment inside these cabinets is comprised of both AC and DC current and includes relays, conductor terminal connections, current transformers, breakers, and fuses. The primary function of this equipment is to activate the trip mechanism of a breaker if voltage or current conditions fall outside the specified trip settings. Connection failures and other heat related damage to equipment inside these cabinets can cause a breaker to trip resulting in widespread power outage throughout a community and/or a facility. Given the vital importance of this equipment, it should be on every thermographer’s inventory list to inspect. 3) image 3 show heating on a plug-in fuse responsible for the switchgear cabinet heater. With onset of warmer weather, the harshness of winter is but a fading memory for most. Left undetected, the damage caused by winter’s fury is a reality that can lead to premature roof failure. Fortunately, an infrared inspection of your roof can detect evidence of problems before they can get out of hand. 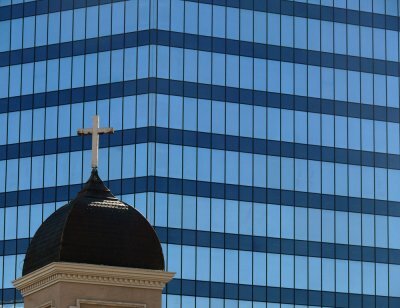 A common question among thermographers who perform infrared inspections of buildings is, “What emissivity setting should I use?” While this might seem like a straightforward question, the answer is not that simple. Recent years have seen a dramatic increase in the use of thermography as a building diagnostics tool. While many applications are qualitative, there are occasions when quantifying temperature can be useful. In order to accurately perform non-contact temperature measurements, one must input the correct emittance value into a radiometer’s computer. While many equate emissivity to values published in emittance tables, emissivity is a dynamic characteristic that is influenced by several factors. These include: wavelength, object temperature, viewing angle, target shape, and surface condition. Each of these factors can vary between projects or during a given inspection. Further compounding the challenge is the fact that not all imagers are created equal. Imagers lacking corrective inputs for atmospheric attenuation and/or reflected temperature often require an exaggerated emittance value be utilized. For qualitative inspections performed with an imaging radiometer, leave the imager’s E control set to 1.0. If possible, turn off all temperature measurement tools. In general, dielectric materials will have a relatively high emittance; shiny surfaces and glass will be quite reflective. Viewing angle and reflected temperature can greatly influence the effective emittance of a material. In particular, smooth-surface roof membranes and building sidewalls can be quite reflective when imaged at low viewing angles often associated with ground-based inspections. Lastly, emittance values obtained from published tables can introduce significant temperature measurement errors. Whenever possible, one should calculate emittance values with the subject imager and cross verify observed temperatures with contact thermometry. Infrared inspections of relay panels containing exposed electrical contacts can be hazardous to your imager’s health! This is especially so when viewing elevator contact switchboards where momentary arcs are visible. Electrical control panels are items that are frequently included in an infrared inspection of electrical distribution systems. Even though most of these relays operate at or around 120 volts AC and 50/60 Hz, the arc that occurs at break generates high intensity electromagnetic pulses that your imager’s shielding can rarely handle at distances of less than four feet. If many relays are actuating randomly you may see momentary wavering to all out loss of vertical sync resulting in a total skewing of the imager’s display screen. The variation in intensity is directly related to how close you are to the subject panel. To minimize the effects of pulsing associated with operating relays, maintain a distance of at least six feet when viewing these panels. Doing so will eliminate or minimize any adverse effect on your imager’s display. Proper image focus is still one of the most important aspects of performing an infrared inspection. A clear image not only allows for optimal problem diagnosis, but it is also critical to accurate temperature measurement. Take time to carefully focus for optimum clarity. This may take some practice if you have a motorized focus mechanism. Ascertain that your target is stationary. Only shoot from a stable platform. If imaging from a motor vehicle, it may be desirable to shut off the engine to avoid vibration. Be sure your imager is steady as you capture the image. Gently push the store button rather than punching it. If using a handheld imager, consider using a tripod or monopod to help stabilize your imager. Once you’ve stored an image, recall and check for clarity. If the results are less than perfect, start over. In addition to greater accuracy, capturing clear images makes it easier to convey information to the end user and/or the person who will eventually perform corrective actions. If you are a thermographer who performs infrared inspections of electrical distribution systems, you are not alone and you never should be. Working alone near exposed, energized electrical equipment is not only dangerous, it is a violation of federal law! Administered by OSHA, the Occupational Safety and Health Standards for General Industry, 29 CFR, Part 1910 apply to most thermographers working within the United States or its territories. Specifically, 1910 Subpart R covers the operation and maintenance of electric power generation, control, transformation, transmission and distribution lines or equipment. Covered facilities include utilities and equivalent industrial establishments. According to Subpart R, prior to the commencement of work, medical and first aid supplies must be provided for, including persons trained in first aid and CPR when work is on or near exposed lines or equipment energized at greater than 50 volts. Since CPR cannot be self-administered, at least two people trained in first aid and CPR must always be present when working near most exposed energized equipment. When performing infrared inspections in the future, having a second CPR trained person along will not only satisfy OSHA requirements, it may save your life should an accident occur! The onset of seasonably warmer weather signals that Summer has returned. For many, it also means the return of mosquitoes and the threat of West Nile virus. Spray insect repellent on the outside of your clothing (mosquitoes can bite through thin clothing). Do not spray insect repellent on skin that is under clothing. Thermographer safety is one of the topics covered in all Infraspection Institute Certified Infrared Thermographer® training courses. For information on thermographer training and certification, visit us online at www.infraspection.com or call us at 609-239-4788. For more complete information on workplace safety, visit the OSHA website. A specification commonly provided for thermal imagers is Instantaneous Field of View or IFOV. Many people mistakenly believe that IFOV values provide meaningful information about a thermal imager’s performance. Unfortunately, this is simply not true. To date, there is no accepted standard for determining IFOV. Consequently, imager manufacturers calculate IFOV values differently, making test results impossible to compare. measurement size for imaging radiometers since accurate temperature measurement requires several pixels, not just one. Stated IFOV values are traditionally reported at 50% radiance or less which is unreliable for both temperature measurement and accurate thermal imaging. The Infraspection Institute Standard for Measuring Distance/Target Size Values for Infrared Imaging Radiometers provides a simple and effective method for determining spot measurement size for any quantitative infrared imager. Proper use of this standard is taught in all Infraspection Institute Level II training courses. For more information on thermographer training and certification or to obtain a copy of the standard, visit us online at www.infraspection.com or call us at 609-239-4788. Purchasers of thermal imagers are often faced with the challenge of which features to look for on new equipment. For some, a video output jack can be a particularly useful feature. Until recently, many thermal imagers featured a video output jack as standard equipment. Video output jacks allow imagers to be coupled with compatible video equipment including external monitors and video recording devices such as camcorders. Prior to using a video output jack, be certain that the video signal is compatible with the chosen video device. For some imagers, video adapters may be necessary to couple the devices. A number of engineering considerations including production costs have caused many manufacturers to remove the video output feature from several models of thermal imagers. Because a video output feature cannot be added to an imager, this feature must be specified at the time of imager purchase. Prior to purchasing any new thermal imager, be certain to try the equipment under the same conditions that you will likely encounter in the future. Level I Infraspection Institute Certified Infrared Thermographer® training course. For information on thermographer training including course locations and dates, visit us online at www.infraspection.com or call us at 609-239-4788. Thermal anomalies are not always as obvious as one might expect. Often, subtle thermal differences can be indicative of major problems. Because infrared thermography is a visual inspection technique, its effectiveness relies on the observation skills of the thermographer. Like any visual inspection technique, a thermographer must actively concentrate on the imagery displayed by their thermal imager. While this approach may sound cumbersome at first, this practice will soon become instinctive and can help prevent you from overlooking the subtle thermal patterns that can be indicative of serious problems. Experienced thermographers know that image clarity is one of the most important considerations in thermal imaging. For thermal imagers, imager frame rate is an important characteristic that can greatly influence image quality. Frame rate or frequency describes the rate at which an imaging device produces unique consecutive images or frames per unit of time. Until recently, most NTSC compatible thermal imagers produced 30 to 60 video frames per second. This frequency provided imagery that was considered ‘real-time’. Thermal imagers that have real-time frame rates permit imaging of either slow moving targets or imaging of targets while the imager is in motion. Examples include infrared inspections where the imager is panned across the face of large targets such as buildings or where the imager is hand carried such as during walkover inspections of a flat roof. For a variety of reasons, many modern imagers are now manufactured with frame rates of less than 30 frames per second. When using an imager that produces less than 30 frames per second, a thermographer will notice ‘ghost trails’ or image smearing should either the imager or target be in motion. This condition will worsen as lower frame rates are encountered. Clear imagery is possible with imagers having a slow frame rate; however, both the target and imager must remain motionless in order to eliminate image smearing. For some imagers, it may take several seconds for the image to become clear. Because of this, slow frame rate imagers may not be suitable for inspecting expansive targets or targets that are constantly in motion. Because frame rate cannot be changed for any imager, this feature must be considered at the time of imager selection and/or purchase. Prior to purchasing any new thermal imager, be certain to try the equipment under the same conditions that you will likely encounter in the future to ensure that the frame rate is adequate.